Hey guys, it's Jill Gardner. Owner/manager of Coffee, Books, and More. South Cove does a lot of community service projects, especially around the holidays, but when my Aunt Jackie suggested we host a Christmas party at the shop in partnership with the local animal shelter, I was all in. You all know I love my dog and it makes me sad to think of all those dogs and cats without a home. Today, we're going to give everyone a bath and get them cleaned up for Saturday's party. My aunt and her new beau, Harrold are coming as well. Although I'm not sure how much help they'll be, but I'm not going to be the one to say that it might be too much work for someone their, ahem, age. Greg is coming to get me and afterwards, we'll probably grab some food with Amy and Justin. He's been slow at the police station which is good because that means people are following the laws. It also means I haven't been investigating anything in weeks. No dead bodies hanging around. No new strangers in town. Nothing. I swear, it's getting a little boring. So today will be fun. Putting a little of the gift giving in Christmas. What's your favorite holiday giving activity you participate in? Tell me about it in the comments below. My author, Lynn Cahoon, will draw one lucky winner to get an e-copy of A Deadly Brew. It's the story I told her about the time when we stayed at the haunted house. Winner will be drawn on Sunday, November 4th. Put some kibble under the tree for me. I've never heard the song. :) But I love it. I love giving the pets some gifts as well. With no kiddos to buy for, we love to grab some Christmas angels off the trees in stores and buy for a few of those kiddos. I figure it's a win-win. We get the joy of shopping, getting out in the holiday crowds and enjoying the giving spirit. Plus, we get the joy of knowing that we have made Christmas morning a little brighter for some kiddos that might now have gotten much or anything otherwise. 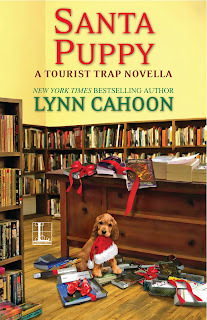 Can't wait for the opportunity to read "Santa Puppy" by Lynn Cahoon. What an adorable cover! I love when the animals get to open their gifts. It is so fun! The program is called "Operation Christmas Child." Favorite holiday activity? Getting together with the family. We adopt a family from the Salvation Army's program. They have kids with their clothing sizes and toy wishes, plus we shop for food for them so that they have a nice Christmas dinner and food for a week. Oops, I guess I needed to add an email. It's somesmartcookle at aol dot com. I fill a shoebox each year for Samaritans Purse to give to a needy child. I also enjoy making gifts to give people. mcastor07 (at) gmail (dot) com. I like having cost limits on gifts. It makes it more fun, and the gifts are more interesting. khpinelake at gmail dot com. Baking Christmas goodies to share. We do a Yankee swap each year. I always give to the Salvation Army at Christmas. I purchase toys for the underprivileged children in the area. And donate food and clothing as well. I want everyone to be able to enjoy their holiday season. Especially the little ones. I usually don't get to see my family on Christmas but make a trip in January to see them all and do the gift giving with them then.